This Java generics tutorial is to introduce basic terminologies related to generics. They are demonstrated with example code and this tutorial is for beginners only. Before we go into detail let us see an example for generics in Java. This is to recall and continue from our previous tutorial for introduction to generics. In the following example we are using the generics type implemented for collections. This shows how we can use a generic type. When a generic type is instantiated, it is called parameterized type. We supply a class/type as parameter for placeholder and create a new object for a generic type. In the above java generics example, we have instantiated a List object by supplying the parameter argument as String. Using a generic type with wildcards is wildcard type. In the below example, we have written a new method using generics which uses the wildcard type. We have not give any actual parameter as argument in the topTwo method. We have used a wildcard ? as argument. This states that we can call this method by passing a List containing any type. We can restrict the wildcard type arguments as applicable to only a specific subtype or supertype. Instead of any type at the place of the wildcard ?, it is restricted to the sub or super classes of a specific class. For example, in the above wildcard type example we can add the keyword ‘extends’ as below and restrict it to a subtype only. This is known as upper bound. Similarly ‘super’ can be used to restrict it to a supertype and is known as lower bound. Following is an example for Java generics demonstrating generic type, parameterized type, wildcard type and bounded wildcard type. This Java generics tutorial you have read now is part two of Generics series and there is lot more to come, keep watching. Comments on "Java Generics Basics"
Nice example code for Wildcard Type, Can We bound it back to List, List topTwoAnimals = topTwo(animalsList);? Is it possible? 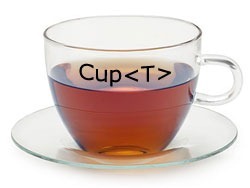 Nice Identification of Tea Cup example. I was still thinking that it would be applicable to data structure mostly, you did change my prespective. extends String ? is it possible? i’m not able to understand that ? What is difference between Generic Type & Wildcard Type? “List<? extends String" is this possible as string is final? It is nice article about Generics and its types. It is good informative and understandable. Thanks for the information and keep going …! I understand the use of bounded wildcard types. But it is not clear to me why one would use wild card. in this we can change the list and know its E type. in this we can not change and this list is instance of some type but we don’t know the type. @JOE: I want to know about Wildcard. can you provide the information about it. Why the name is Wildcard? Thanks for the awesome tutorials. Btw, I noticed that the tags (used to specify types) are actually not displayed in Google Chrome browser. Comments are closed for "Java Generics Basics".